With the little guys coming from a proud nautical tradition, it was never going to be long before they found themselves in Falmouth. Situated – as the name may suggest – on the mouth of the River Fal on the south coast of Cornwall, this town and port has long been at the heart of Britain’s maritime heritage. I had to head down that way for work, so the Crew happily tagged along. And having heard that Falmouth RNLI offered guided tours of the station and its two lifeboats, there was considerable excitement in the car on the way down. 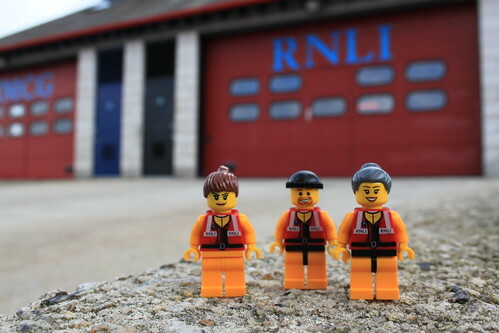 Here are the little guys in front of the station, which is shared with the Coastguard. Moored alongside the boathouse is (normally) the station’s Severn class all-weather lifeboat, the ‘Richard Cox Scott’. However, when we were there, the boat was itself away for a refit, so had been replaced temporarily by the relief lifeboat ‘Osier’. 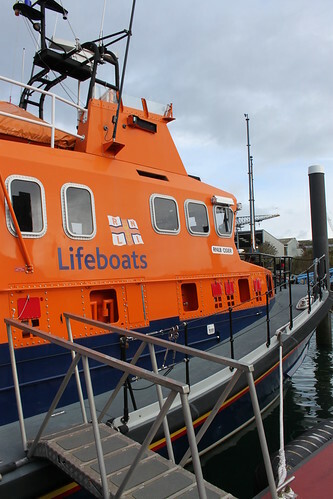 The two boats are essentially the same, but lifeboat geeks (like the Crew) might be interested to know that the ‘Osier’ has a small crane to launch the inflatable ‘Y-boat’ stored on the cabin roof, while the ‘Richard Cox Scott’ has a ramp mechanism to launch the tender over the stern. Anyway, here’s the ‘Osier’. You can just see the little Y-boat on the left. The Crew were delighted that Simon, one of the RNLI volunteers, was available to show us around. We started in the boathouse itself, looking at the inshore lifeboat and all of the kit that the (real) crew have to keep them safe out on the water. 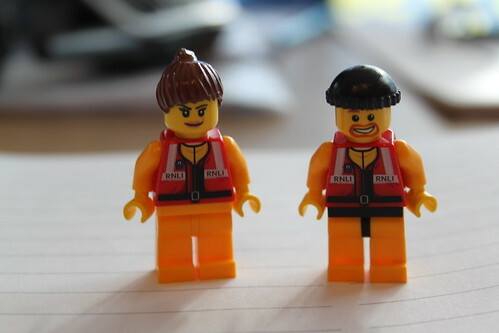 Simon was especially keen to point out that the helmets worn by lifeboat crew members are made in Cornwall. We then moved over to the all-weather lifeboat. 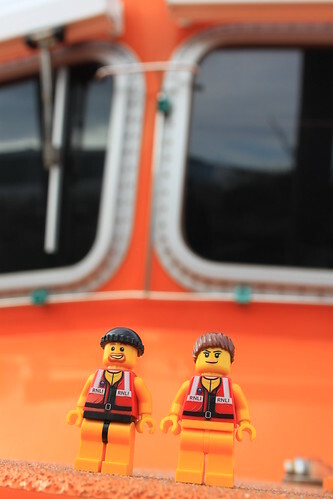 And the Crew got even more exited when I pulled the little guys out of my pocket (I know, they surely deserve better travel arrangements) and asked Simon if it would be OK to take some photos of them on the boat. So here are Mechanic Dave and Crew Member Susie on the deck of the ‘Osier’. 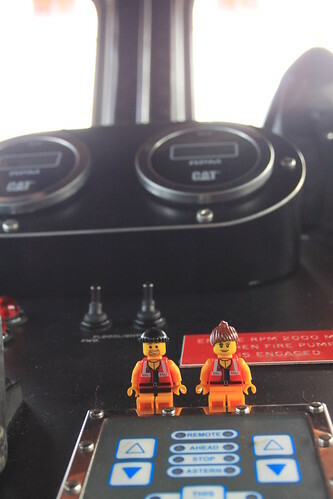 And here they are in the wheelhouse, checking out the engine controls. The boat has two Caterpillar 3412 TA marine diesel engines, which each produce 1,250 horsepower at 2,300 revolutions per minute. So I was very keen that the little guys didn’t touch anything. As we made our way around the ‘Osier’, Simon told us about some of the history of the station. Falmouth got its first lifeboat way back in 1867, when the ‘City of Gloucester’ arrived on station. The boat was funded by the people of Gloucester, hence the name. But despite serving in Falmouth for twenty years, the boat saved only two lives. And these were, Simon told us with a wry grin, people who fell into Gloucester Docks during the new boat’s naming ceremony. Our final stop was the upper steering position on the flybridge. 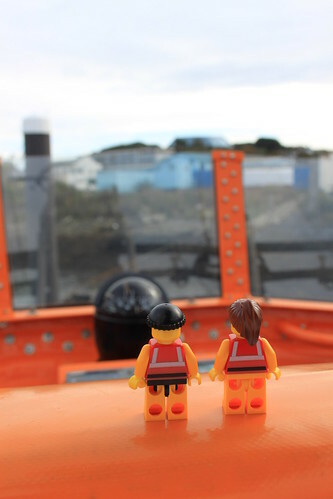 From here, the lifeboat’s crew have much better visibility, which is ideal if they are trying to come alongside another boat or to find someone in the water. The Crew definitely liked the view from this high up. With our visit now coming to an end, all that remained was to thank Simon for a most excellent tour and to pop in to have a look in the RNLI shop attached to the station. And the Crew couldn’t resist a last quick photo as I signed the guestbook. A big thank you to all at Falmouth RNLI for a brilliant visit. Both the Crew and I had an absolutely fantastic time. And we were all really impressed with the station, the boats, the volunteers and the outstanding base of local support that was evident around the town. Nothing embodies our nation’s maritime heritage more, in our view, than the courage, commitment and skill of the RNLI and its volunteers. 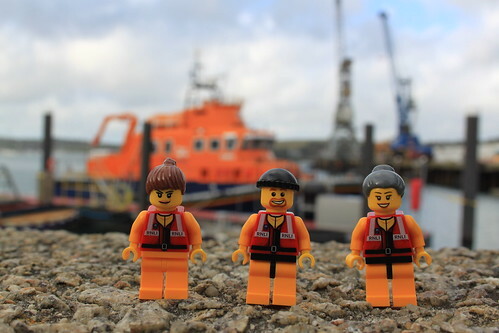 This entry was posted in Out and about and tagged Falmouth, Lifeboats, RNLI, The Lifeboat Crew by Simon Perks. Bookmark the permalink.